The Chernobyl Nuclear Power Plant melted down in 1986, creating a 1,000-square-mile exclusion zone that has been almost completely devoid of human interference for decades. Now you can take a tour, courtesy of a camera-carrying drone. Mutually exclusive? Apocalypse versus brave new worlds? I think not. In fact, the Communion of Dreams/St Cybi’s Well ‘universe’ contains both. If I ever decide to write them, I have books set in the 2020s, about 15 years following the fire-flu pandemic, and in the 2030s in the Israeli colonies on the Moon. In the first the world will feel much like what’s seen in the Chernobyl exclusion zone. And in the second I’ve envisioned how the 1/6th Earth-normal gravity would allow for playing something very much like Quiddich on small personal flyers in large domed stadiums. It’s important to remember that the future isn’t either/or. It’s even more important to remember that we will have a role in creating that future, for good or ill.
Just a quick reminder: Communion of Dreams is free today! Yay!! The promotion started yesterday, and so far has had more than 100 downloads world-wide. I still think that it’s fun that people in a wide variety of different countries (as represented by different Amazon portals) download it with each promo. This time the list already includes Australia, Brazil, Canada, Germany, India, and The UK. That’s just cool. So, share the news, and go download it if you haven’t already! What you’re looking at is pureed super-hot Habaneros. With just enough vinegar and salt to preserve them for canning. This morning I made a batch of my Habanero Sriracha sauce. One of my standards. But I decided to do it a little bit differently this year. Rather than use a limited amount of Habaneros in it, and just blend them in, I added a full two gallons of frozen habs to the vinegar & tomato sauce mixture and cooked them until soft. Then I removed all the peppers, setting them aside to cool. There’s still plenty of heat and flavor from the habs in the Sriracha (recipe below). But then I added some more salt and a little apple cider vinegar to the cooked Habaneros, and ran the whole lot through a food processor. And that’s in the pic above. The idea behind this isn’t that you’d actually use this stuff directly on food, like you would a hot sauce or some of my Habanero Dust from a spice grinder. Rather, it’s intended to be used in very small amounts as the basis for some larger dish or sauce, giving you just concentrated (almost pure) Habanero flavor and heat. I’ll put it into 4 ounce jars for a very limited number of insane friends. Just thought I’d share the idea. Add all ingredients into large pot. Heat to simmer, stirring often. Remove Habaneros. Simmer rest for half an hour or so, then allow to cool. 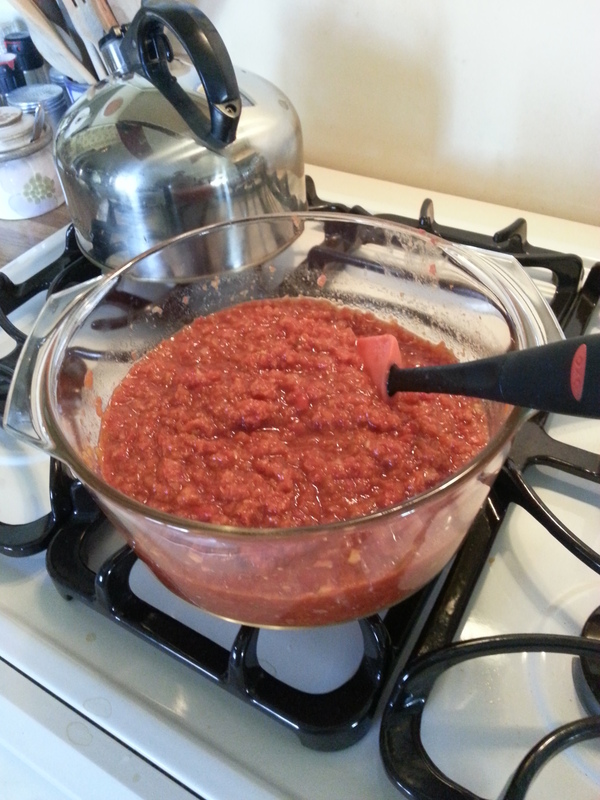 EDIT NOTE: After trying the Sriracha prior to canning, I decided that it was just plain too hot, so added another couple of quarts of tomato sauce and changed the total above. Everything else still seemed pretty much in balance after. I think the heat level was masking some other problems earlier. In the end, Nolan got elegant images that advance the story. Thorne got a movie that teaches a mass audience some real, accurate science. But he also got something he didn’t expect: a scientific discovery. “This is our observational data,” he says of the movie’s visualizations. “That’s the way nature behaves. Period.” Thorne says he can get at least two published articles out of it. The video is remarkable. Seriously. Go watch it. A new image from ALMA, the Atacama Large Millimeter/submillimeter Array, reveals extraordinarily fine detail that has never been seen before in the planet-forming disc around a young star. ALMA’s new high-resolution capabilities were achieved by spacing the antennas up to 15 kilometers apart . This new result represents an enormous step forward in the understanding of how protoplanetary discs develop and how planets form. ALMA has obtained its most detailed image yet showing the structure of the disc around HL Tau , a million-year-old Sun-like star located approximately 450 light-years from Earth in the constellation of Taurus. The image exceeds all expectations and reveals a series of concentric and bright rings, separated by gaps. That’s not computer-rendered theory. That’s an actual image, showing the formation of planets around this very young star. A path led around past the buildings, then into a fair-sized rectangular terrace, the remnants of the Roman walls still clear and exposed in places. And the western and southern gate foundations were still surprisingly intact, from what he could see even at a distance of a hundred meters or so. He decided to cross the grounds of the old fort, go directly to the south gate. “You make it sound as though you were actually here,” said Darnell.